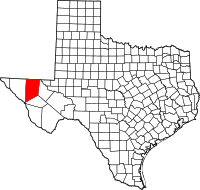 Culberson County is in the Central Time Zone, however, northwestern Culberson County, including Guadalupe Mountains National Park, unofficially observes Mountain Time. It is one of the nine counties that comprise the Trans-Pecos region of West Texas. Prehistoric Clovis culture peoples in Culberson County lived in the rock shelters and caves nestled near water supplies. These people left behind artifacts and pictographs as evidence of their presence. With its treacherous topography, the area remained untouched by white explorations for centuries. Jumano Indians led the Antonio de Espejo 1582-1583 expedition near Toyah Lake on a better route to the farming and trade area of La Junta de los Ríos. Espejo's diary places the Jumano along the Pecos River and its tributaries. Antonio de Espejo was also the first white person to see the Mescalero Apache just east of the Guadalupe Mountains. The Mescalero  frequented the area to irrigate their crops. In 1849 John Salmon "RIP" Ford explored the area between San Antonio and El Paso noting in his mapped report the productive land upon which the Mescalero Indians farmed. By the mid-17th Century the Mescaleros expanded their territory to the Plains Navajos and Pueblos from the Guadalupes, and El Paso del Norte. Their feared presence in the area deterred white settlers. January 1870, a group of soldiers attacked a Mescalero Apache village near Delaware Creek in the Guadalupe Mountains. July 1880 soldiers at Tinaja de las Palmas attacked a group of Mescaleros led by Chief Victorio. August 1880, Buffalo Soldiers ambushed Victorio at Rattlesnake Springs. Victorio retreated to Mexico and was killed in October by Mexican soldiers. The demand for new routes from Texas to California caused an uptick in explorations. The San Antonio to El Paso leg of the San Antonio-California Trail was surveyed in 1848 under the direction of John Coffee Hays. Texas Commissioner Robert Simpson Neighbors  was sent by Governor Peter Hansborough Bell in 1850 to organize El Paso. Lt. Francis Theodore Bryan camped at Guadalupe Pass while exploring a route from San Antonio to El Paso via Fredericksburg. Upon reaching El Paso in July 1849 his report recommended sink wells along the route. July 1848, Secretary of War William L. Marcy wanted a military post established on the north side of the Rio Grande. Maj. Jefferson Van Horne was sent out in 1849 to establish Marcy's goal. John Russell Bartlett, was commissioned in 1850 to carry out the Treaty of Guadalupe Hidalgo. Bartlett declared the Guadalupe Mountains dark and gloomy, and proposed a transcontinental railroad be built south of the peaks. Three years later, Capt. John Pope was sent to scout out a railroad route, and in the succeeding year to search for artesian water supplies. The San Antonio-San Diego Mail Line and the Butterfield Overland Mail both serviced the area 1857-1861. These mail coaches provided a means for travelers to reach California in 27 days, if the passenger had the $200 for a one-way fare and was courageous enough to withstand the weather and dangers en route. Rival railway companies began competing for rights of way. The Texas and Pacific Railway and the Galveston, Harrisburg and San Antonio Railway eventually reached an agreement to share the tracks. Culberson County was established in 1911 from El Paso County and named after David B. Culberson. The county was organized in 1912. Van Horn became the county seat. With the opening of the railways, ranchers began to settle in the county. Lobo was settled in part due to misreprentation by promoters. A class action lawsuit by the residents forced the promoters to build the Lobo Hotel. Unfortunately, the area was struck by two powerful earthquakes - one in 1929, and the 6.0 quake near Valentine that was felt as far away as Dallas. The hotel was destroyed. Guadalupe Mountains National Park was established in 1972. President Lyndon B. Johnson signed the 1966 legislation to create the park. Stipulation was made that all mineral, oil and gas rights had to be ceded to the Federal government. Blue Origin, the space vehicle development company founded by Jeff Bezos, maintains a sub-orbital launch site approximately 25 miles north of Van Horn, Texas. According to the U.S. Census Bureau, the county has a total area of 3,813 square miles (9,880 km2), of which 3,813 square miles (9,880 km2) is land and 0.2 square miles (0.52 km2) (0.01%) is water. It is the fifth largest county by area in Texas. The largest part of Guadalupe Mountains National Park lies in the northwest corner of the county, including McKittrick Canyon and Guadalupe Peak, the highest natural point in Texas at 8,751 feet (2,667 m). As of the 2010 United States Census, there were 2,398 people residing in the county. 78.9% were White, 1.3% Native American, 1.0% Asian, 0.6% Black or African American, 15.4% of some other race and 2.8% of two or more races. 76.2% were Hispanic or Latino (of any race). As of the census of 2000, there were 2,975 people, 1,052 households, and 797 families residing in the county. The population density was less than 1/km² (1/sq mi). There were 1,321 housing units at an average density of 0 per square mile (0/km²). The racial makeup of the county was 68.94% White, 0.71% Black or African American, 0.47% Native American, 0.57% Asian, 27.13% from other races, and 2.18% from two or more races. 72.24% of the population were Hispanic or Latino of any race. There were 1,052 households out of which 39.10% had children under the age of 18 living with them, 58.20% were married couples living together, 13.50% had a female householder with no husband present, and 24.20% were non-families. 21.50% of all households were made up of individuals and 7.40% had someone living alone who was 65 years of age or older. The average household size was 2.82 and the average family size was 3.30. In the county, the population was spread out with 32.20% under the age of 18, 7.80% from 18 to 24, 25.80% from 25 to 44, 23.00% from 45 to 64, and 11.20% who were 65 years of age or older. The median age was 33 years. For every 100 females there were 102.70 males. For every 100 females age 18 and over, there were 97.10 males. The median income for a household in the county was $25,882, and the median income for a family was $28,547. Males had a median income of $22,500 versus $14,817 for females. The per capita income for the county was $11,493. About 21.50% of families and 25.10% of the population were below the poverty line, including 30.20% of those under age 18 and 19.40% of those age 65 or over. ^ Stout, Joseph A. "Chief Victorio". King Snake. Retrieved 30 April 2010. ^ Davis, Stanford L. "Victorio's War". Buffalo Soldier. Archived from the original on 2007-09-21. Stanford L. Davis, M.A. ^ Kohout, Martin Donell: Culberson County from the Handbook of Texas Online. Retrieved 30 April 2010. Texas State Historical Association. ^ "Bartlett, John Russell". The John Russell Bartlett Society. Retrieved 30 April 2010. ^ "San Antonio-San Diego Mail". State of California Parks Department. Retrieved 30 April 2010. ^ "San Antonio-California Trail". Texas Historical Marker. Retrieved 30 April 2010. ^ "Texas and Pacific Railway". Texas and Pacific Railway. Retrieved 30 April 2010. ^ "Galveston, Harrisburg and San Antonio Railway". Texas Transportation Museum. Retrieved 30 April 2010. ^ "Culberson, David Browning". Find A Grave. Retrieved 30 April 2010. ^ "Van Horn, Texas". Texas Escapes - Blueprints For Travel, LLC. Retrieved 30 April 2010. Texas Escapes - Blueprints For Travel, LLC. ^ "Texas Earthquakes". Institute for Geophysics. Archived from the original on April 3, 2010. Retrieved 30 April 2010. ^ "Lobo, Texas". Lobo, Texas. Retrieved 30 April 2010. ^ "Guadalupe Mountains National Park". National Park Service. Retrieved 30 April 2010.